Back in 2012 Sample Logic developed a game-changing arpeggiator that shook up the industry and left all other arpeggiators in the shade. This ground-breaking piece of scripting was named the “Step Animator” and it became the driving force behind a fantastic multi-genre sample library, the original ARPOLOGY. This library conjured magic from single instruments with incredibly versatile step animation. Fast forward to 2018 and Sample Logic is shaking things up again, but this time taking arpeggiators to a whole new level. The team has spent an entire year developing ARPOLOGY: CINEMATIC DIMENSIONS which quadruples the power of the original ARPOLOGY with the addition of an all new 4-core performance engine, individually animating 4 instruments to create one cohesive sound. This allows users to blend up to 4 instruments while using different arp patterns at the same time, yielding amazingly creative results. 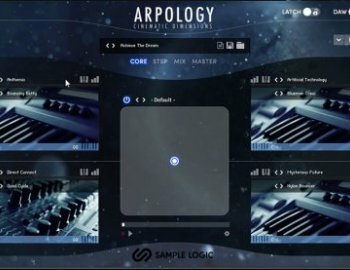 This new iteration of ARPOLOGY is not only more powerful, but includes 23+GB of recorded instruments (from the original ARPOLOGY and newly recorded content). The library boasts over 1,200 presets designed to deliver flexible sequencing and arpeggiated grooves for all types of cinematic productions. Sample Logic’s proprietary 4-core Step Animator with XY Mixer. Entirely “randomizable” interface for instant and infinite inspiration. Animator MIDI drag and drop technology. SYSTEM REQUIREMENTS: Full retail version of Kontakt 5.8 or higher.